The Swiss capped a remarkable week in which she defeated four Top 10 players to claim her third career title. 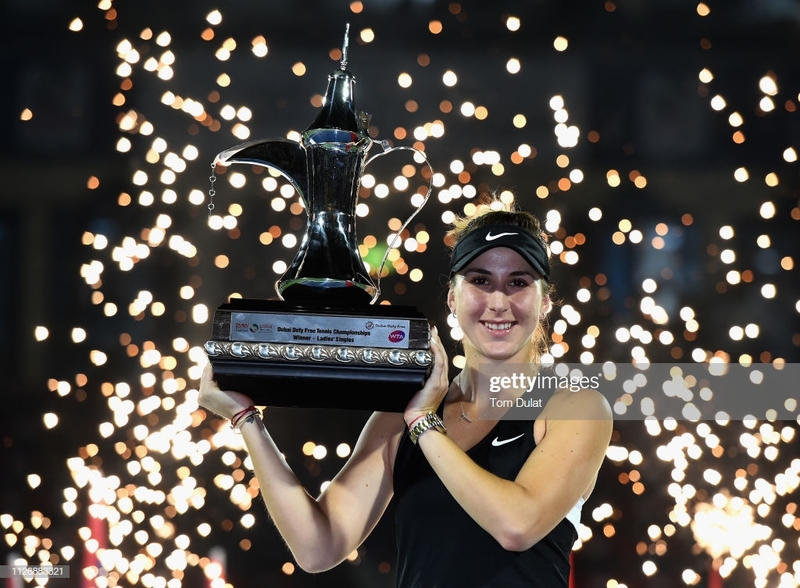 In what was a thrilling climax to an outstanding week of tennis, Belinda Bencic took home the Dubai Duty Free Tennis Championships title with a 6-3, 1-6, 6-2 victory over second seed Petra Kvitova in the final, the Swiss' first career win over the Czech in four career meetings. Bencic completed a week in which she upset four consecutive top ten players in Aryna Sabalenka, Simona Halep, Elina Svitolina and Kvitova to raise her first trophy since 2015. All three of the 21 year old's titles have come at the Premier level or above. Bencic was off and running, breaking to love in the opening game of the match with a searing crosscourt backhand. Kvitova had to save a pair of break points in her next service game before managing a hold. Another unreturned backhand from the Swiss gave her a double break lead at 4-1. The Czech rallied, winning consecutive games to get one of the breaks back and cut into Bencic's lead, making the score 4-3. After a battling hold to put the 21-year old a game away from the opening set, she broke Kvitova's serve for a third time, again her backhand finding the mark for a winner to close out the set 6-3. Kvitova struck first in the second set, breaking after Bencic missed with a backhand over the baseline. A slice of good fortune gave the Czech a second break as her backhand clipped the top of the tape and dribbled over. Now with a 3-0 lead, the two-time major champion was looking more and more comfortable in all areas of her game as the Swiss started to leak errors. Finally, a hold to 15 got Bencic on the board in the middle set, but she still trailed 4-1. An ace on game point brought Kvitova to within the brink of closing out the set and she rallied on Bencic's next service game, overturning a 40-15 deficit to club back-to-back backhand winners to claim the second set 6-1, one set to determine the champion. After each woman held to begin the third set, Bencic held three break points in the third game. After Kvitova saved the first with a backhand winner, she double-faulted on the second, handing the Swiss the early lead at 2-1. The Swiss escaped her next service game and continued to maintain a one break edge, leading 4-2. After falling into a 0-30 hole, the Czech fired an ace, but facing another break point, she flew a forehand long to give Bencic a 5-2 lead. Serving for the championship, the Swiss fell behind 15-30, but battled to reach championship point, saved by Kvitova. Given a second chance to take the title, the Czech floated a final forehand long to seal Bencic's win and bring her back into the top 25 in the rankings.